Blurb: Now is the time for fearlessness. Piper Perish inhales air and exhales art. The sooner she and her best friends Enzo and Kit can get out of Houston and get into art school in New York City, the better. It’s been Piper’s dream her whole life, and now that senior year is halfway over, she’s never felt more ready. But in the final months before graduation, life’s got Piper a little more breathless. Things are weird with Kit and awful with Enzo; art school is looking increasingly impossible; three different guys have each claimed a different piece of Piper’s heart; and Piper’s sister’s tyrannical mental state seems to thwart every attempt at happiness for the Perish family. Piper’s art just might be enough to get her out. But is she strong enough—and brave enough—to seize that power, even if it means giving up what she’s always known? Be now. Then be bow. Be now, now, now. 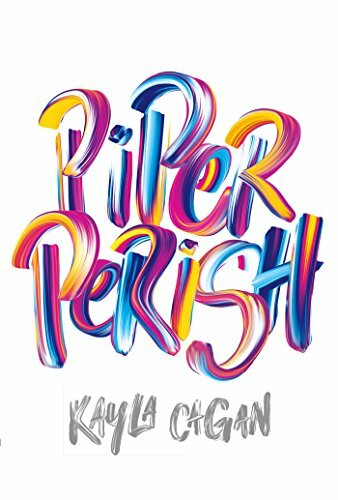 I’ve got to admit that I am all over the place regarding Kayla Cagan’s Piper Perish. For the most part, I enjoyed the story of Piper who aspires to be the next Andy Warhol. She sounds like a typical high school student, although a very talented one, dreaming of a perfect future. The novel is written in diary form, but breaks that at times to include emails, etc. As such, the style is very conversational. Probably my biggest hangup was with the character of Piper. For the most part she seemed like a typical teen, but then she could be a brat and horribly spoiled and self-involved. (Hopefully these aren’t the current trends for typical teens.) She seemed oblivious to her own behavior. Likewise, her sister, Marli, has issues, extreme anger management issues, which grow worse. At points I thought: the parents really, really spoiled these two. I have little enjoyment in reading about whiny, self-absorbed, spoiled teens so I was always happy when the scene would change and those nail-on-chalkboard traits disappeared. Cagan does, however, do a good job of showing the confusion of being a teen. The last quarter of the novel unleashes a bit of a fairy tale, which almost seemed like it might pave the way for an Act II. If there is one, I hope the characters are a bit more fully realized. Also, I hope to see a lot of Silas who seemed like a good guy despite having “judgy” parents. So, where does that leave us? Piper Perish held my interest throughout, even when I was grinding my teeth over Piper’s behavior. The writing shows an authentic style. While it didn’t live up to my original expectations, I still think it’s a pretty good novel probably of more interest to the readers of ya fiction who like books with an artsy-fartsy feel.